Music: Gianni Ferrio et al. 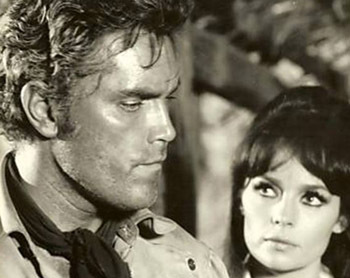 Jeffrey Hunter is dishonored Confederate soldier Joe Collins, who was set up for a crime he didn’t commit. The Texas Rangers were swift to track Joe down, which led him to head south into Mexico where he makes a living selling guns to bandits. While at a bar one day, a young woman Lisa (Pascale Petit) comes in offering gold to those men brave enough to save her husband who is buried under a landslide. Lisa and her husband got into their predicament defending their goldmine from bandits. Joe reluctantly agrees to help her and assembles his own gang of Mexican gunfighters go to against the gang of Chato, a powerful bandit leader who controls all of Mexico. Joe and his gang attempt to traverse the hostile Mexican territory in order to save Lisa’s husband and retain the gold. However, he can’t even trust his own men, who’d sooner slit his throat when he’s asleep. Everyone must work together, however, if they are to survive the constant attacks of Chato and his bandit army! Find a Place to Die is one of Giuliano Carnimeo’s first films, and the sloppy direction definitely holds back the movie’s potential. Despite a surprisingly multi-layered script with an abundance of characters, Carnimeo can not get the job done. The script maintains that Joe and his gang do not trust each other. This makes for some potentially tense and paranoid scenes. But the director fails to generate any suspense out of these situations. To his credit, the action sequences are well staged. 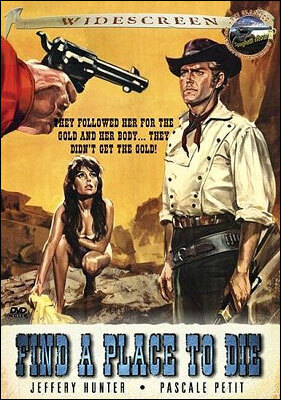 Carnimeo eventually became a superior Spaghetti Western director, but Find a Place to Die lacks the skill and polish of his later productions. Hunter is a little out of place here in such a physical role, and his performance and look is clearly based on that of Franco Nero. The cinematography, usually a selling point of these movies, is surprisingly lame. The movie is loaded with some wonderfully ugly visuals, including Chato and his band of toothless outlaws. Find a Place to Die is highlighted by a wonderful score courtesy of Gianni Ferrio. The music is more emotional than expected of the genre, and certainly elevates the movie higher than it deserves to be. This was one of Hunter’s last films. He had a financial interest in the picture, and controlled its initial distribution in the United States. He died in 1969.